Injection molding is used extensively throughout the medical device industry. In the continued search for compliant, cost effective production methods, more and more companies are switching to fabrication techniques that offer economies of scale, such as injection molding, for both high and low volume production. This week we sat down with our new product development and product transfer teams to talk about how injection molding works, the three things every medical device company should know about injection molding, and the many advanced injection molding solutions Biomerics has to offer. How does injection molding work? For this post, we will be focusing specifically on thermoplastic injection molding. “The basic cold runner injection molding process for thermoplastics is simple,” explained Travis Hathaway, a Process Engineer at Biomerics with over 15 years of injection molding experience. “Depending on whether the material is hygroscopic or non-hygroscopic, it is transferred to the machine from either a dryer or a holding container. Because hygroscopic materials absorb moisture, they must be dried prior to processing to prevent material degradation, which is why they are prepared in a dryer. Non-hygroscopic material is stored and moved from a container. “Once the material is transferred from the dryer, it is funneled through a hopper and, depending on the situation, an additive compounder. It is then transferred into the barrel using a single shot loader. After the material (i.e. the “shot”) is loaded into the barrel, it is conveyed and melted by shear heat. 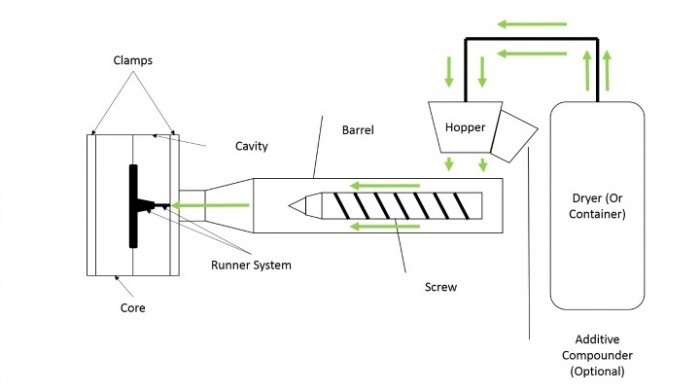 Once melted, the screw slowly injects the shot into the mold through the runner system. The shot is then forced through the gate, filling the cavity and core of the mold. “According to the Design Control Guidance for Medical Device Manufacturers (FDA, 1997), all special processes involved in the creation of an FDA device must be validated,” remarked Dan Brittingham, VP of Engineering at Biomerics. “This includes injection molding. If you want to be able to legally sell your molded device after you make it, your molding process has to be validated. For this reason, I always suggest that teams plan to validate their injection molding tools. “Validation doesn’t have to be as tricky and complex as people make it out to be,” expanded Chad Beddes, Process Engineer at Biomerics with over 21 years of experience. “Validation for injection molding should only evaluate process sensitive dimensions. Dimensions that do not change with process adjustments are not indicators of process stability. What injection molding solutions does Biomerics offer? At Biomerics, we offer a wide range of injection molding solutions to meet the most demanding device needs. Our cross functional engineering teams utilize scientific injection molding principles to develop and optimize processes, components, and finished devices. Through our dynamic ISO 13485 compliant quality management system, we are able to partner with customers to design and validate processes and tooling used in medical injection molding. We specialize in high volume cleanroom molding, vertical overmolding, and low volume custom molding. Our vertical and horizontal presses (which ranging up to 900 tons) allow us to meet the injection molding needs of the most unique devices. U.S. Federal Drug Administration (1997). Design Control Guidance for Medical Device Manufacturers. Washington, D.C.
For more information, visit www.biomerics.com.